Archie Comics has done an incredible job of revamping, updating, and marketing their line of comics. Archie, Jughead, and the Archie Horror line have been critical successes for honoring its characters with modern fun stories or reimagining them under scary ones. It's no easy task to keep the momentum going if you're Adam Hughes who was tapped to do the same with Betty & Veronica. It's an uneven debut with questionable decisions including making the iconic frenemies supporting characters in their own book. Hughes is unquestionably a talented comic veteran that goes without saying. He may have been an odd choice for this series but so was Mark Waid on Archie and he's produced some of the best stuff in his career. So as both artist and writer, Hughes has a lot invested in this series by going out of his comfort zone. Unfortunately, the result is mostly entertaining but not an easy read. The surprising narrator is Jughead's suddenly talkative and verbose dog Hot Dog. It's a cute gimmick that gets old especially when pages are "missing" because he ate them. The dialogue between Archie and Jughead is funny and natural creating some nice character development to open the story. The same can't be said for Betty and Veronica who don't interact in a similar fashion or as often. The conflict for the Riverdale gang is Pop's soda shop is in trouble and Betty leads the charge to help save it from a big corporate coffee chain. This is where she finally emerges, fired up, rallying the gang with her passion for saving the shop. It's not enough though because until the twist at the end, there isn't a real conversation between Betty and Veronica. When it finally happens it's confrontational and angry. We get some dimensions from Betty but Veronica is barely in her own issue. I can't help but compare this series with other Archie books and it's disappointing that Hughes' creative choices don't pan out. Considering the art is great as expected from Hughes with muted pastel colors from Jose Villarrubia I wish I could have seen more of it. Hughes injects a ton of word balloons that fill up panels leaving what little beautiful art there is. There are even pages made up of mostly all balloons on a white background. It's all too meta for me even as a fan of Harly Quinn and Deadpool. It's evident that Hughes wants 'Betty & Veronica' to be fun and quirky. There's a core of that here but reaches too far becoming too cute for its own good. 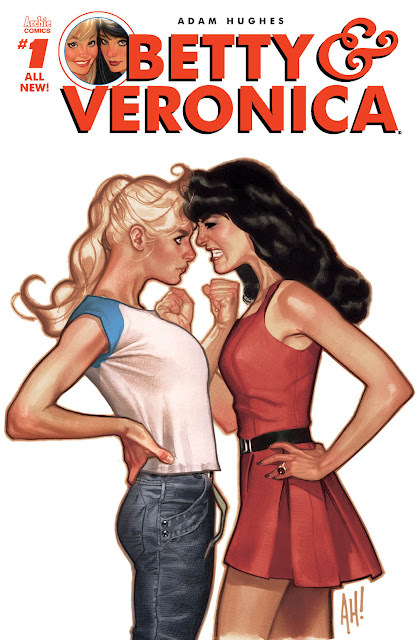 With the conflict established between them at the end, issue two will be vital in determining whether 'Betty & Veronica' keeps Archie Comics winning streak alive or not. The first issue has put that in doubt.